Mae Hong Son is actually a pretty small town near the north-western border of Thailand. But it is also a very charming place to visit, and there are many activities that you can participate in. It also has a lovely setting – in the mountains, often covered in a fog that gives it a mystic atmosphere. If you come to Mae Hong Son, one of the things you should really do is to go trekking. It’s location makes it easy to go on trips into the nature that are just wonderful. Just make sure you come here at the right time of the year, because particularly during Monsoon season, it can be difficult and dangerous to go into the nature. Between November to February, it’s high season and especially on the weekends it can sometimes get quite busy – although quite busy in a very relaxed manner, and it never becomes as crowded as in some of the other tourist hot spots. The people here are also genuinely friendly and polite, and enjoy a relaxed and laid-back lifestyle. 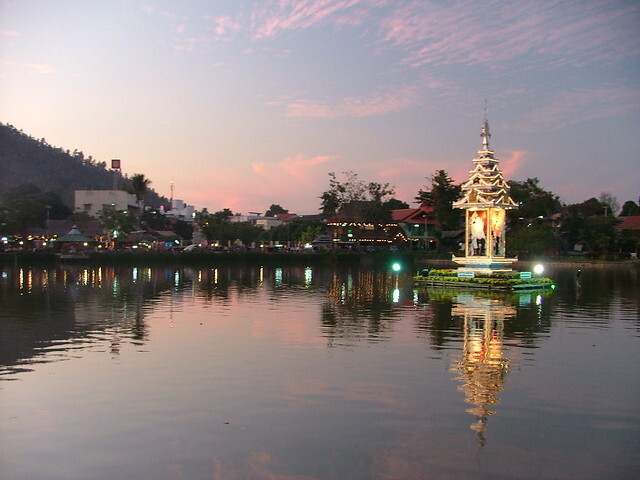 The city is also interesting from an ethnic viewpoint – half of the population here is of Thai Yai origins – and you can see that in different aspects of life, including the temples, religious traditions, the food and so on. There are also many Karen, Lisu, Hmong and Lawa hill tribe people living here, and in the province of Mae Hong Son you find some Burmese refugee camps. The official founding year of Mae Hong Son was 1831, but for many years it was very isolated from the rest of Thailand. It was known as the “Siberia of Thailand”, because many politicians from Bangkok who made some major mistakes or got the wrong enemies where transferred to a post in Mae Hong Son. The first paved road that connected Mae Hong Son to the outside world was built in 1968. It’s a small town but you can find ATMs, a tourist police and also an office of the Tourism Authority of Thailand here, lots of guest houses, hotels, tour agencies and restaurants. On Sundays, there’s a small market, and in the morning ours you can find a morning market near the bus station and the Wat Hua Wiang temple where you can see (and buy) lots of produce from hill tribe people, which can be quite interesting if you have an interest for foreign foods and ingredients and spices. It’s best to come with a personal tour guide who can explain you about different plants and spices and foods, because many people here do not speak good English. Wat Doi Kong Mu is also a nice temple to visit, because from there you get a good view of the area. You can travel to Mae Hong Son by car, van or bus, but that’s a long way or you just take an airplane. Whether you are looking for budget guest houses, homestay, wellness resorts or luxury hotels – Mae Hong Son has something good to offer for each of these. Particularly the Fern Resort Mae Hong Son stands out, because it’s managed with the right spirit: it’s eco-friendly and it’s also friendly to the community of the area. Lots of people who work here are local villagers, and the vicinities are really nice.